The second stop on our Philly Sandwich Quest was Q.T. 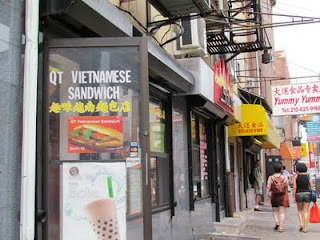 Vietnamese Sandwich, located in Chinatown at 10th & Arch, for their Banh Mi sandwich. 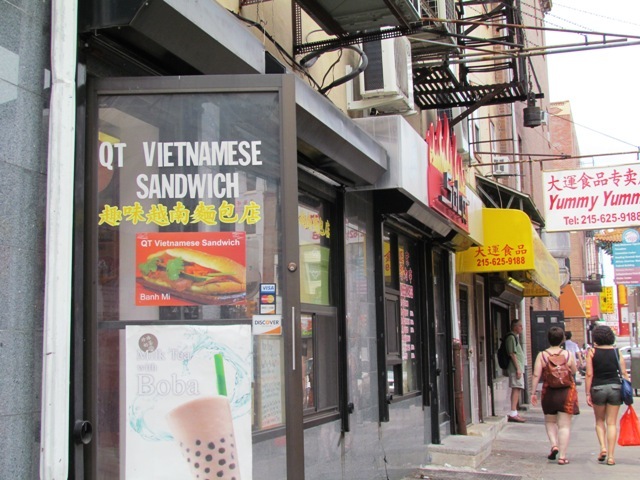 Anticipation was high since many claim the banh mi is one of the best sandwiches in Philadelphia - a high bar indeed. For those who are not familiar, a banh mi is basically a Vietnamese-style hoagie consisting of a baguette, Vietnamese style meats and ingredients such as cilantro, pickled carrots and peppers. Like any good sandwich, the bread is the key to a good banh mi. We ordered the House Special banh mi and the pork banh mi, both just under $5 for about a 10 inch sandwich. It's a a decent deal, but many say the prices at Q.T. are on the expensive side for banh mi. The house special includes vietnamese ham, BBQ pork, apparently pork ears and a spread of pork liver pate. Each sandwich at Q.T. 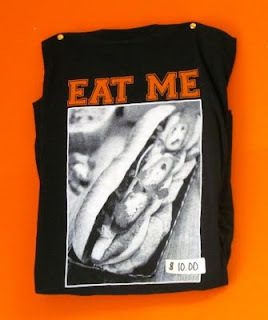 comes with pickled carrots, cilantro, cucumbers and jalepeno peppers (optional). The pork banh mi had a variation of mayo. Neither of us particularly enjoyed the first bite of the house special. It was hard to pinpoint the reason, but we chalked it up to either the different style of meats or the sauce. But, the house special certainly grew on us and was the favorite of the two sandwiches. The pork banh mi was average at best and I thought they could have added more jalepenos to give it some more kick. The best part of both sandwiches was the baguette - light, airy on the inside and crispy on the outside. I would stop by Q.T. just for the baguettes. Anyone know where they order it from or if it's made in-house? In the end the hype of the venerable banh mi didn't match the result. It was a good sandwich, but we're not sure what all the fuss is about. We've had other sandwiches that we like much better. Overall it is not a place we would go out of our way to frequent or suggest to a friend as something they must try. We debated why our impressions were different from what others have said, and concluded that our preference is for heartier sandwiches such as Paesano's. If you are looking for a lighter lunch, though, the banh mi would be a good choice since it does not sit heavy. Plus it's not every day you get to eat banh mi and we think everyone should enjoy the fun of trying something new and different. We would like to try another Vietnamese place to see if there is a difference, so pass along any suggestions. Q.T. 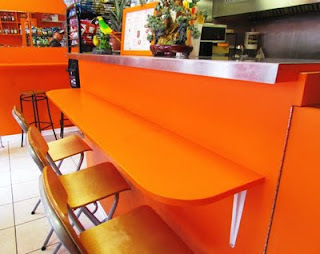 is a small place with bright orange coloring with enough seating for 8-10 people. From what we can tell many order to-go and there was a constant flow of people, but never a long line. The service was quick and the owner was pleasant. There is also a pretty big selection of drinks and chips to eat on the side. To find it, look for the name on the door - there is no sign hanging out into the street. i've never quite understood the allure of the banh mi. sure it's different, but it's not for me i guess. The Banh Mi sandwich really depends on the bread and the meat. and it is a nice sandwich but not slathered with mayo or any sauces. 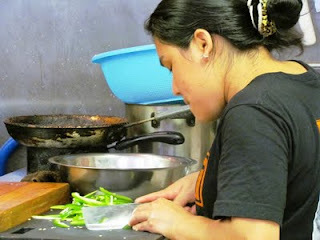 As a result it is really dependent on the ingredients. Usually the fresh veggies and herbs add a little kick to the sandwich but it is definitely the bread that makes it and most places bake their own - homemade baguettes when done right are great. 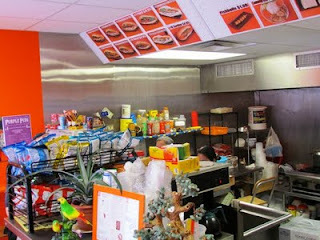 For another example of real deal banh mi visit Cafe Houng Lan at 1037 S 8th. The banh mi is one of the world's unique sandwiches and has been well covered in Philly foodie circles. The next wave underway is fusion offerings like Sampan's made with pork belly. Agreed on the recommendation of Cafe Houng Lan. 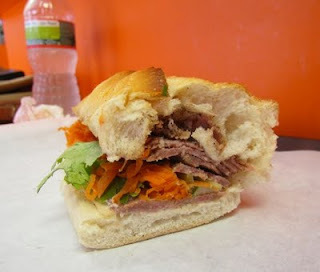 Also, Ba Le on Washington Ave. makes great banh mi's, but for takeout only. you need to order the banh mi thit nuong, which is the grilled pork. the "house special" normally consists of vietnamese style meats and pate, which has an acquired taste. the banh mi thit nuong will be good for any palette and then of course, it needs to swim in the red rooster sauce. QT is just plain bad. For a city that has one of the largest Vietnamese populations on the East Coast, you sadly can't get a great banh mi in Philadelphia. There are some passable ones here and there, but QT definitely ranks in the bottom half. I recently moved here from Chicago and I must admit The Vietnamese "Banh Mi" sandwiches here are pretty awful. Ba Le was from Chicago and their sandwiches were really good in Chicago, but here I don't even bother wasting my time with any of the sandwich shops here.